Even if you are a cheese lover like me, sometimes you need a non-dairy meal. Whether it’s a dietary preference, allergy, or kosher reason, you need some go-to festive dishes that don’t rely on meat for substance, nor milk or cheese for richness. 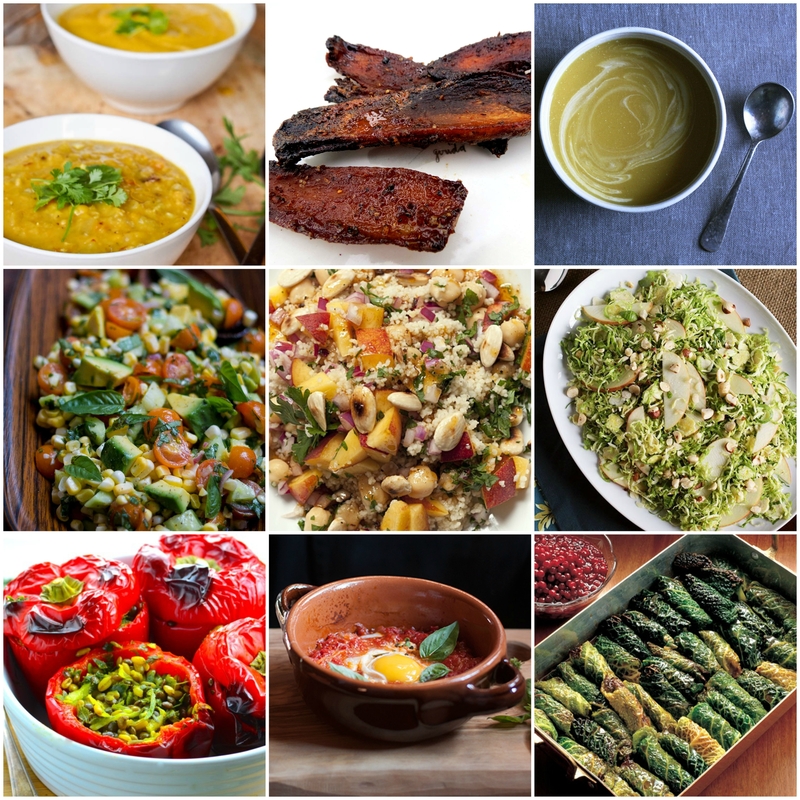 Check out these beautiful dishes from soup to salads, sides to main dishes. Vegan Red Lentil and Apple Soup – richly spiced and a bit sweet from our beloved symbolic food, this would be welcome as a starter to a lentil-centric meal of vegetarian biryani. Vegan Mushroom Bacon – Use this as a topping for salad or soup for a nice change of pace that is much tastier and healthier than tofu bacon. Butternut Squash with Miso and Coconut – Butternut squash and pumpkin are a symbolic food for the new year. Some say it is because the pumpkin is round like the year, and a crown. Others say it that the golden color promises wealth in the coming year. Yet others say it is the sweet taste that we chose as an emblem of our hopes for a sweet new year. I think it is just delicious. This vegan soup boasts miso for savoriness and coconut cream for richness. Fresh Corn, Tomato, Avocado, and Basil Salad – Here in California, the fruits of summer are still plentiful. I’m intending to use multi-colored cherry tomatoes for extra vibrancy in this healthy, crunchy, creamy salad. It is very similar to my fiancé’s favorite salad, and I think the addition of basil will make it even more festive. Nigel Slater’s Couscous with Chickpeas and Nectarines – Now, I know nectarines aren’t in season in most parts of the world, even though I can still find beautiful ones at our Bay Area farmer’s market. This would be delicious with chunks of plum, fig, apple, or even diced roasted squash. The chickpeas add substance and the toasted almonds are a lovely touch. On a side note, Ras El Hanout is an excellent spice blend to have around for roasted vegetables and lamb. Shaved Brussel Sprout Salad with Apples and Hazelnuts – Please note that there is browned butter in the dressing of this salad. I would use melted coconut oil instead for a fantastic extra flavor. I might even add some toasted coconut flakes to the salad itself. Freekeh Stuffed Peppers – Freekeh is green cracked wheat that is traditional in the Middle East and gaining popularity globally for its chewy texture and unique flavor. This vegan recipe would be very welcome as a main or side dish with a large spread of salads and hummus. Italian-Style Eggs in Fresh Tomato Sauce – Shakshouka is one of my favorite dishes and I love finding its analogue in lots of cultures and culinary traditions. M.F.K. Fisher introduced Americans to Eggs in Hell in her books and I can think of no better way to celebrate the last of the fresh tomatoes than in a fresh sauce to poach eggs. Another take is to pack your sauce with artichokes, potatoes, and capers. Rice and Raisin-Stuffed Cabbage – Rolled and stuffed foods can be symbolic too – of fullness, of sustenance from the Almighty, of the Torah scrolls, etc. I just like the traditionalism of stuffed foods, especially stuffed cabbage. My mother, like her grandmother before her, make meat and rice-stuffed cabbage in a sweet and sour tomato sauce. This take is sweeter and vegan with rice (I would use brown rice for extra nuttiness and texture) and raisins as another promise of a sweet and fruitful new year. Up Next – The Sweets! Challah, cake, apples, honey, and pomegranate as far as the eye can see!